The Wedding Ring Studio at Ember is the perfect place to create an unforgettable wedding experience. Wedding rings are symbolic of love and commitment and we believe they should be unique and personal to each individual couple. At the Wedding Ring Studio, in the heart of Belfast, we offer the opportunity for you, the bride and groom, the chance to create your own wedding rings, under the expert supervision from award winning jewellery designer Cyril Flannigan. At the Wedding Ring Studio we guarantee that out of this unique opportunity you will receive the perfect wedding rings. Prior to your studio experience, we will have an initial design consultation with you, where you will meet with Cyril to discuss your requirements and design ideas. After the consultation, we will book your studio day, and make all the necessary preparations based on your agreed designs. The studio day experience will begin with a brief overview of the process from start to finish and what your role will be in creating your own perfect wedding rings. After your introduction of the process, you will be hands on involved in the skilful process of shaping and soldering your bands to size. After which you will break for a romantic lunch, complements of the Wedding Ring Studio. After lunch you will return to the studio where you will undertake the fine finishing process, leaving you with your own unique wedding bands. 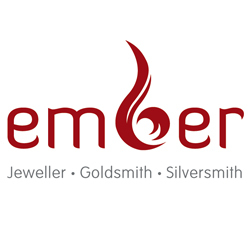 Ember will send your finished bands to the Assay office where they will be hallmarked. Finally, your rings can either be delivered to you or collected at our studio in Belfast.